A mysterious estate. A collector on a mission. Will one man’s discovery change Christian history forever? Joel Cohen has inherited a heavy burden. Still grieving his father’s death, the antique dealer examines the strange box his embittered patriarch left behind. As he pries further, Joel is stunned to discover first-hand records of the death of Jesus. Will Joel survive exposing a world-altering secret or will vicious demons bury both him and the past? 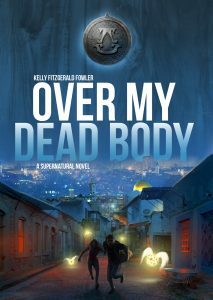 Over My Dead Body is an exhilarating supernatural thriller. If you like ancient prophecies, biblical mysteries, and page-turning action, then you'll love Kelly Fitzgerald Fowler's epic adventure. Buy Over My Dead Body to lift the lid on the world's greatest mystery today!